Home / All Blog News>Travel to Sheki city of Azerbaijan. What to see and what to taste? Sheki or Shaki - it is written in 2 ways on the internet is located in the northwestern part of Azerbaijan. The former name of Sheki until 1968 year was Nuxa (Nukha). So do not surprise when you will see this name on that city too. It is situating in the southern part of Greater Caucasus mountain range and it is 325 km far from Baku city. Sheki one of the cities of Azerbaijan which keeps its ancient history. You will feel that while walking on the streets, meet with local people and taste their delicious food. The citizens of Sheki`s accent is rarely different from all other regions. They have the most positive accent which you can speak in Azerbaijani. Even if they will speak about negative situation it seems like a funny story :)). That`s why in Azerbaijan we have lots of funny stories which come from Sheki citizens. The main sightseeings starts from the street name after Mirza Fatali Akhundzade. He was author, playwright, philosopher, and founder of modern literary criticism and was born on July 12, 1812 in Sheki. For getting more information about this great personality you can visit his home museum near that street. So walking on this street you will see typical style of Sheki, The red walls, houses, sweet shops and etc. On the upper side there is famous sightseeing of "Sheki which is Palace of Sheki Khans" (Picture on the cover). Nearby there are "Upper Caravanserai" and "Lower Caravanserai". 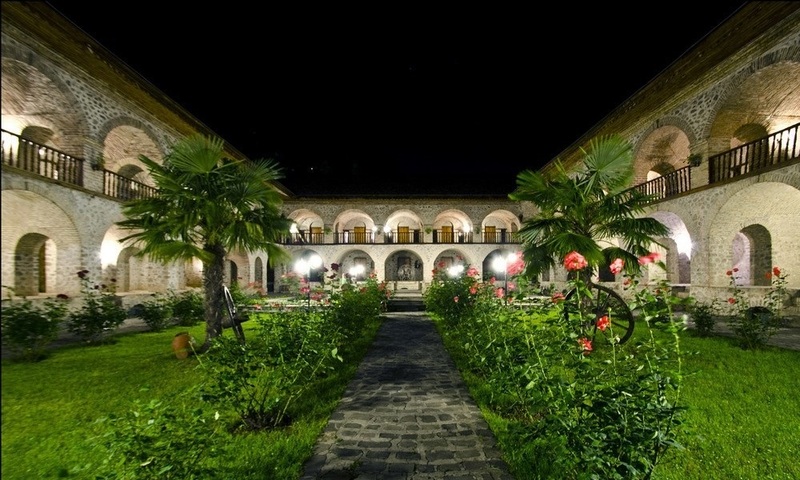 Also it is recommended to see the Sheki Historical museum which is near to the exit of Khans` Palace. After the visits of sightseeings which are in central destination it is recommended to go and see one of the oldest churches of Caucasian Albania which name is "Kish Church". This destination is about 5 km far from Sheki city. Sheki is very famous in Azerbaijan with its cuisine. Even in Baku we can see the restaurant with the name "Sheki". I recommed to you for lunch to taste "Piti" which is main meal of Sheki. They cook it in a special pot and it has special service type which you need to see. It is recommended to visit "Qubernator" restaurant which is also near to that famous street: Mirza Fatali Akhundzade. But be aware that Sheki citizens use more oil in their food. For sweet try Sheki halva or pakhlava. Some people call it as halva, and some pakhlava. But with cooking type actually it is Sheki Halva. We are providing tour to Sheki. With our tours you will be more confident and you will not get any stress about how to manage the tour. Just believe to our team.